Easter is just around the corner. I am fairly certain it falls on the 21st of April this year. A Sunday of course. But here is the thing. I don’t get Easter. As hard as I have tried, since I was a little kid, I don’t understand it. I should clarify a few things before I go any further. I understand the Bible story. I get that. Believe me, I spent the majority of formative years in Catholic grade schools, middle schools, and high schools. We went to church every day, and by this time of year, we were eating Fried Fish on Friday’s. With lots of tartar sauce. Which hardly seemed like any kind of a sacrifice to me. It was more of a sacrifice on the part of the fish, I suppose. Anyway, we did the “Stations of the Cross” every Friday until the incense burnt the hairs right out of our nostrils. Some of the stations were worse than others. Gruesome. And, to this day, I have some questions about the actual details of the story, but for the most part, I could follow. I always thought Easter was the Holiest of Days, but I guess it is a toss up for some, with Christmas. 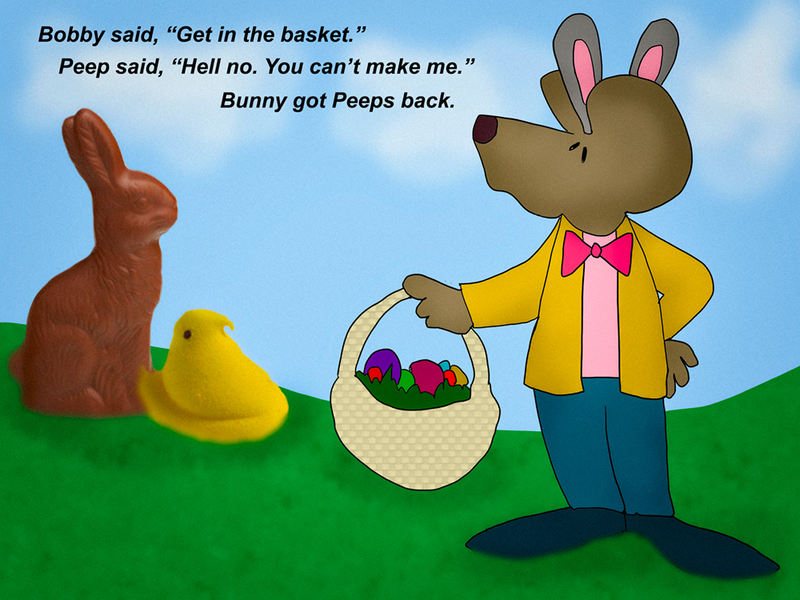 The part I don’t get about Easter is the celebration thing. I don’t understand why chickens are laying colored eggs about. And, hard boiled ones at that. What is the connection there? What is the purpose of these colored eggs and the subsequent hunting of these eggs? And of course. Rabbits. Check that. Bunnies. I am not sure what the distinction is between a rabbit and a bunny might be. Perhaps some 4-H-er somewhere can assist me with the clarification. But the correct terminology at this holiday is “Easter Bunny” and NOT, “Easter Rabbit.” Whenever I refer to the Easter Rabbit, I am quickly corrected. There is not one iota of data that offers an explanation for any of this. And let’s not even get started on the Jelly Beans. Or, the faux grass in basket that intertwines with all the beans and the other small candies. It used to just be green shredded plastic. Now it comes in a variety of colors. In a basket. Why? I don’t expect any answers here. I started asking my parents about 50 years ago. They didn’t know. Other friends, families, and strangers have not been able to answer the mystery either. Which, by the way, seems to be larger than the heads on Easter Island. • Unicorn Barf. Yum. This magical tub of cotton candy lets you “retaste the rainbow.” An Easter Adventure. • Bunny’s Berries. The package claims that there’s “a little bit of poop in every bite” and it shows an Easter Bunny with a roll of toilet paper. • In honor of Prince, there are now “Purple Rain” Jelly Bird Eggs. And, believe me, there are so many more. But the final one I will mention here comes down to another mystery I’ve never understood. • Peeps. I know one or two people like them. But when I was a kid, they always went directly into the trash, or to my sister Julie, who would eat anything. However, just when you thought Easter could not get any stranger, they now have started producing “Pancake and Syrup” Peeps. Oh yes they did. I’ll say it again. Pancake and Syrup Peeps. Life is full of mysteries, I suppose. I’ll probably never get to the bottom of this one. But I can tell you. I am keeping a close eye on our chickens this week.